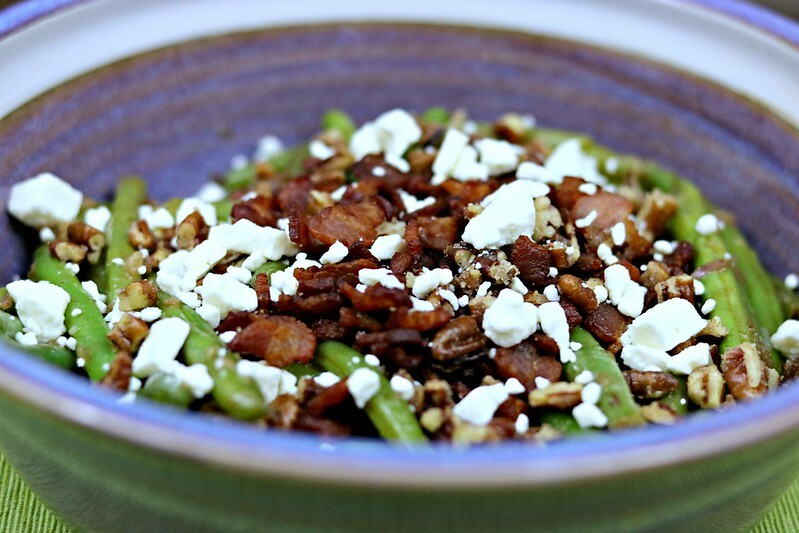 These tender-crisp green beans with a sweet and tangy Dijon maple sauce, topped with caramelized pecans, crispy bacon, and feta crumbles will be the side dish that everyone is talking about this holiday season. Welcome to Holiday Side Dish Week! This week, on Monday, Wednesday, Friday, and Sunday twenty amazing bloggers will be sharing delicious holiday side dishes! There’s quite a variety of recipes and you can be sure to find something yummy to add to your holiday table, so make sure to check back each of the four days for new ideas! Side dishes are definitely one area where I tend to struggle for variety, so anytime I find a recipe or actually make a vegetable side dish that isn’t just a pan of roasted <fill in the blank>, I get really excited. Especially when it’s easy to make but feels like a fancy dish. 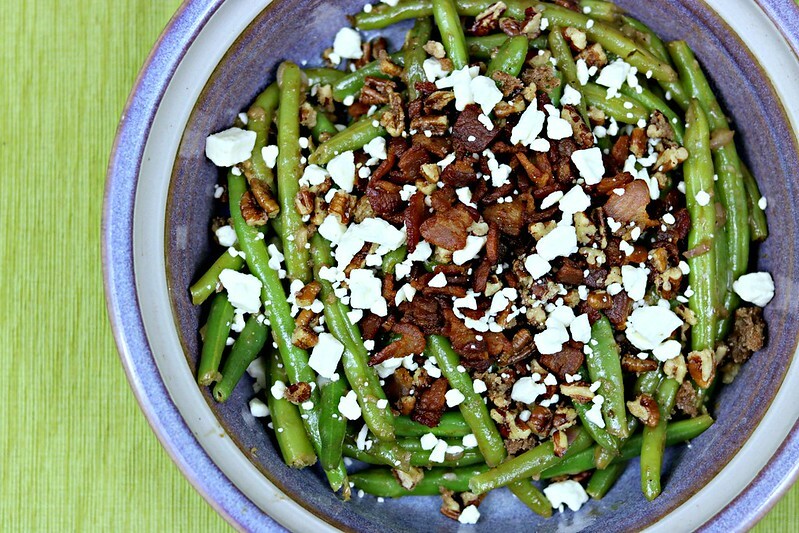 These Dijon maple green beans with caramelized pecans, bacon, and feta are just that kind of dish. 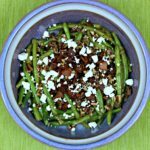 While traditional green bean casserole is usually a go-to holiday dish for many, I’d venture to say that this green bean dish will blow it out of the water, and become a new traditional green bean side dish! 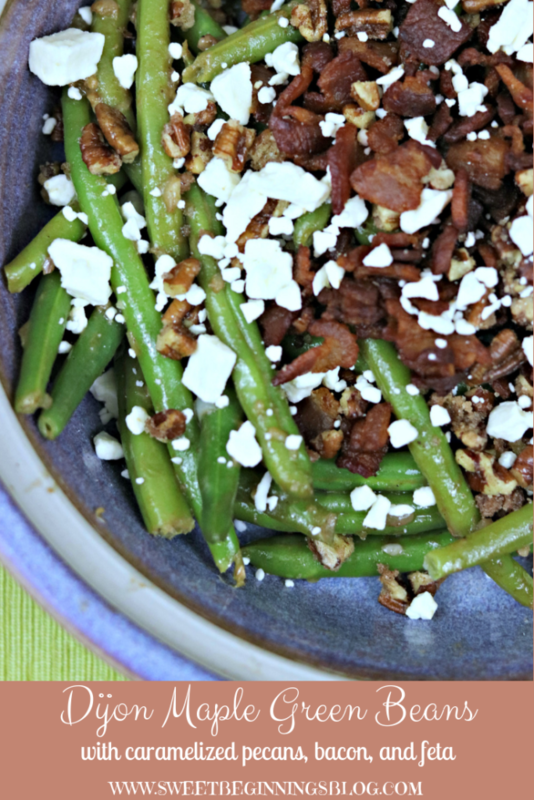 Not only are the green beans perfectly crisp-tender and coated in a delicious sweet and tangy Dijon maple sauce, but then you add the crunchy caramelized pecans and bacon and creamy feta crumbles?!?!? How is that not the best combination of flavors and textures that you could ever ask for?? The husband and the toddler both loved it, and the rest of the family will get to enjoy it this holiday season as well. Don’t miss out on all the food fun, friends!! Make sure this dish is on your table this year! Cut bacon into one-inch pieces and cook in a skillet over medium heat, stirring often, until browned and crisp. Remove to a paper-towel lined plate and set aside. Remove grease and wipe out the skillet for later use. Heat a small non-stick skillet over medium heat and add the pecans, sugar, butter, and cinnamon. Stir constantly with a heat-proof spoon or spatula for approximately 5 minutes (less time if your nuts are chopped smaller) until the pecans are evenly coated in the melted sugar and butter. Transfer pecans to parchment or wax paper and spread out right away, or wait until they harden and cool, and then break them apart. Cooling should take approximately 5-7 minutes. Blanch green beans in a large stock pot of salted boiling water for 2 minutes. Drain and set aside. Using the skillet from the bacon, melt butter over medium heat. Add shallots, garlic and red pepper flakes and saute for 1 minute. Add beans and Dijon Maple Sauce and continue to saute until beans are evenly coated in the sauce and beans and cooked to desired crisp-tenderness. Taste and season with additional red pepper flakes, salt and pepper to taste. 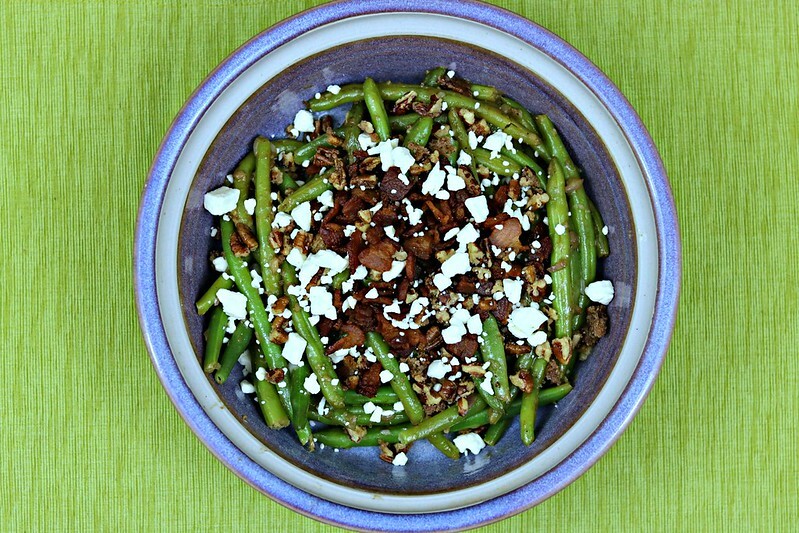 Put green beans into a large bowl and top with caramelized pecans, bacon, and feta cheese before serving! While the green beans are cooking, combine all of the Dijon Maple Sauce ingredients together in a small bowl, and set aside until ready to use. Love this. What a great alternative to the typical green bean casserole. A nice switch from green bean casserole! I’m usually not a huge fan of green beans, but with all the goodies in these, that could easily change! What a great twist on the usual green beans! That dijon glaze sounds scrumptious!